Anne Karpf’s CiF piece on Aug. 5, France and the Holocaust: A return of the repressed, focused on a new French film, Sarah’s Key, and the reluctance of the nation to honestly come to terms with the deportation, by French Authorities, of 13,000 French Jews in 1942 – only 25 of whom survived. Not surprisingly, the piece elicited a high volume of comments beneath the line. Among the comments was this, by HushedSilence, responding to another commenter’s thinly veiled criticism of the influence of Jews in Hollywood – but adding an equally pertinent observation regarding the Guardian’s well-documented disproportionate focus on Israel. And, then, well, not only can’t my primitive screen capture software take a snapshot of empty space, I couldn’t even find a funny representation of nothingness on Google Images. The comment wasn’t simply deleted – a CiF moderator act which produces the commenter’s moniker and time of comment – but literally vanished without a trace. Then there was this comment by MacManus on the phases of European anti-Semitism, which included an observation about the pernicious influence of the Guardian’s well-known ideological orientation. As we’ve learned, comment may be free but criticism of the Guardian is forbidden. I would assume it was the statement that most antisemitic attacks are the work of Muslims which was seen as the problem here. Come on, Adam. You must know that any posts quoting a deleted comment are themselves removed without trace. It happens to all posts on all threads. And the MacManus post – even though it makes valid points – could ultimately be deemed off-topic. 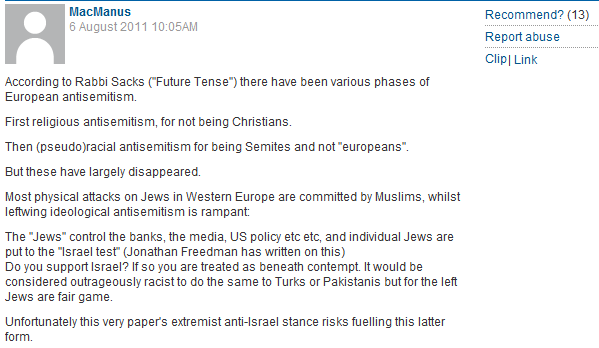 According to Rabbi Sacks (“Future Tense”) there have been various phases of European antisemitism. First religious antisemitism, for not being Christians. Then (pseudo)racial antisemitism for being Semites and not “europeans”. But these have largely disappeared. Do you support Israel? If so you are treated as beneath contempt. It would be considered outrageously racist to do the same to Turks or Pakistanis but for the left Jews are fair game. I am mildly surprised that Guardian censors allowed the comment to stay put. It’s kinda out of character. Anyhoo, MacManus hit the nail on the head.